Christmas horror at Miss Universe pageant or Trump campaign ploy? Next to Santa getting stuck in a chimney due to an overly large body part, can one imagine a tragedy worse than what unfolded live at the Miss Universe Pageant on the Sunday before Christmas? Oh, you didn’t see it? You, the sane one, above it all, who doesn’t partake in such light bon-bons as beauty pageants? Yes, I know, and it’s blatantly sexist too. But for Asian Americans, beauty pageants are one of life’s guilty pleasures that have a strange appeal to both men and women of all ages. Like many Asian Americans, I grew up with beauty queens and pageants as part of my ethnic Filipino tradition. And then there are all the niche pageants we have. Ever been to a GAPA pageant? But Miss Universe is the Super Bowl of beauty pageants. It’s not regional. It’s not national. It’s not niche. It’s the whole damn Universe. And besides, it’s not Donald Trump’s Universe anymore. We have ancestral homeland rooting interests. One is ethnically obligated. Just look at this year’s Asian diversity in the Top Ten: Miss Japan was a bi-racial beauty, Ariana Miyamoto; Miss Thailand, Aniporn Chalermburanawong; and a Miss Philippines with the un-Filipino sounding name of Pia Alonzo Wurtzbach. If she seemed slightly augmented as compared to the others, well, she was. She was part German. Born in Stuttgart to a German father and Filipina mother, Wurtzbach is both a model and a chef, which brings to mind a variation of the old Chinese food joke that may or may not work with Filipino German food? An hour later, you’re hungry for power? On Sunday, we were hungry for an explanation. 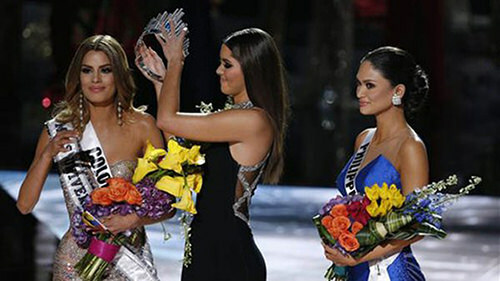 Miss Universe ended like the movie “Carrie,” but with no blood and telekinesis. Just a glaring host boo-boo that will be talked about for as long as there are sash-bearing pageants. Comedian, author, talk host, game show host Steve Harvey was at the helm. And for the most part, he was fine. I mean, it’s not “Family Feud.” But when it came to naming the winner, from the time Harvey announced “Miss Universe 2015…,” there was a 12-second gap. And it wasn’t just for drama. I think he was actually trying to figure out who the winner was as he opened the envelope. It was down to two, Miss Philippines and Miss Colombia, who were both supportively hugging in that show of beauty queen-faux good will. From that point on, it was probably the slowest two-and-a-half-minutes in the history of beauty pageants. At :08, Miss Colombia Ariadna Gutierrez gets a hug. She’s given her country’s flag to wave at :17. At :19 she gets sashed. Sashed! Then come the flowers. And why wait for the big get-up? The tiara is on her head at :44. Pardon me for looking at this like the Zapruder film. I’m not searching for a second gunman or a conspiracy. Time is significant because usually, as in football, if you snap the ball before there’s a call for a video challenge, the play goes through. And the crowning of the tiara is as close to starting a reign as you are going to get. Now, I am on the west coast, and when some dutiful pageant-watching friends on the east coast saw all this live, they alerted your scribe as to this real life snafu taking place live. It’s not Miss Colombia, it’s Miss Philippines, they tell me, and I, as an American Filipino, should be happy, they say. But….. I was too busy eating my vegan tacos to care about such trifles until the west coast feed. Believe me, I was fully expecting to see more of an “oops” moment, where the oops is immediately acknowledged, and, well, no harm, no foul. There are a full 12 seconds of gasping and shrieking in dozens of languages. When I saw it in Northern California, the local FOX station didn’t even give Miss Philippines her moment in the sun. It cut it off right at 10 pm. OK, I know, we must put this all in perspective. But there is a fairy tale in these kinds of entertainments. And when all that and the fakeness of beauty get obliterated by something so real and human as a major screw-up, the show becomes a worthy tragedy. These aren’t just mannequins on heels. Unlike Carrie, Miss Colombia got no blood spilled on her, but she must have been horrified. Later in a video, she was seen pushing back tears as only a jilted queen can do. “Everything happens for reason, so I’m happy,” she says on a tape the pageant provided to NBC News. And poor Steve Harvey, whom I love as a standup and host, had to feel bad. He took full responsibility for the boo-boo in the You Tube clip. I know an honest mistake. This wouldn’t happen if we made the pageant required viewing as a geography and spelling lesson. If there’s one silver lining, it may be because you’ll recall last year’s brouhaha between Donald Trump and NBC, when Trump made comments about undocumented immigrants (not the phrase he uses). Trump bought out NBC for the rights to the show, held the stock for a bit, then sold it off to WME/IMG, which put it on Fox. That may have been your cover to watch the proceedings to imagine a world without Trump. But it may also turn out to be a campaign ploy for Trump. Could you conceive of the show ending the way it did had Trump been involved? And then, he was on the TODAY show, extending his time, when he talked of all things world politics, to talk about what he really knows. Co-winner? What? And he thinks the tiny Philippines would allow itself to be robbed to justify human error? Would Trump accept a co-winner role in New Hampshire or Iowa? I think not. But that’s it. Trump’s real genius is clear. He should stop running for president, and just take over as the country’s Beauty Pageant Czar before another beauty queen is falsely tiara-ed. He can make Miss Universe great again!